Last year we introduced you to Rabbi Bob Alper, a Reform rabbi who went from the pulpit to the comedy stage, and who still leads High Holiday services in Philadelphia. He bills himself as "the only practicing rabbi in the world doing stand-up comedy intentionally." Last Friday he was on hand at an interfaith workshop to teach clergy and divinity students how to inject humor into their sermons. Yesterday's New York Times had a feature story about the session, Humor in Ministry, led by the Rev. Susan Sparks, pastor of the Madison Avenue Baptist Church in New York, who also moonlights as a nightclub comedian and who sometimes works with Rabbi Alper. Ms. Sparks and Rabbi Alper, invited as part of the seminary’s “field-based” program to teach some of the intangibles of ministry not covered in the divinity curriculum, surveyed the arc of potentially humorous situations — including weddings, funerals and long, hot summer days when even the sermonizer can lose the thread of a sermon. They discussed the often-overlooked humor in some passages of the Bible, including Jesus’ use of irony and exaggeration, and the ribaldry in the Book of Esther. They reviewed the basic etiquette of being funny at a funeral. (“It has to be very carefully done,” Rabbi Alper said.) They talked technique — how it helps to edit sermons, to stay topical and to use small words. But both Ms. Sparks and Rabbi Alper took pains to assert — as almost all comedians who talk about comedy do — that being funny is a serious business. During their class, she and Rabbi Alper, 65, swerved between riffing on a sampling of their funniest material and exploring what they called “the theological underpinnings of religion and humor”: using humor in interfaith bridge-building, making jokes during hard times, and the rhetoric of being funny. 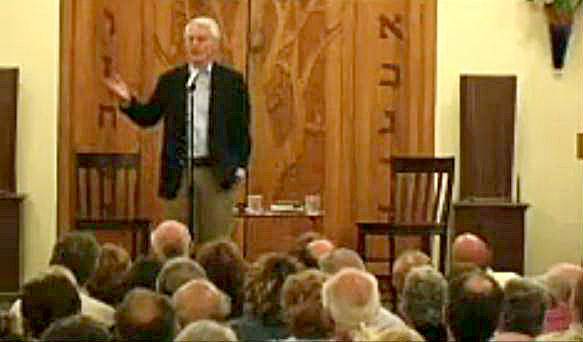 To get a taste of Rabbi Alper's rabbinical humor, here are five minutes of highlights from his 70 minute show. Enjoy!